Queen Elizabeth II’s accession to the throne took place on 6th February on the death of her father King George VI. Her coronation however was on 6th June 1953 and it was for that June date that special celebrations were planned and an extra Bank Holiday granted. Hampshire took part in national celebrations with events held all over the county, including the biggest celebrations outside of London which were held in Southampton. All three ships of the Cunard fleet (Queen Mary 2, Queen Elizabeth and Queen Victoria) sailed in formation up the Solent on 5th June to start the biggest Jubilee celebrations outside of London. The approach to port began soon after first light with a tug spraying two impressive water jets to welcome the boats into port. The ships were followed by a flotilla of small boats. 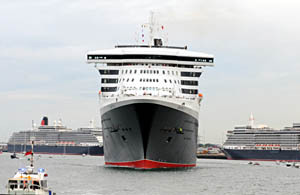 Queen Victoria and Queen Elizabeth came bow-to-bow alongside the Western Docks as Queen Mary 2 started turning. Rather fittingly, Abba’s “Dancing Queen” was playing on her public address system as she manouvered into position. Queen Mary 2 positioned herself proudly with her stern to her sister ships before herself docking. As they berthed, the whistles sounded to salute her Majesty’s Diamond Jubilee. 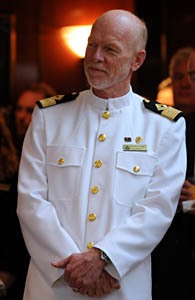 Thousands of passengers from all three ships lined the decks waving flags, joining in the celebrations. The Red Arrows were due to join Cunard’s Three Ship Diamond Jubilee Tribute to The Queen and it would have been the first time that the Red Arrows have ever displayed in Southampton skies. Unfortunately, because of poor weather this could not go ahead. However, lucky passengers on the Queen Elizabeth got to meet the crew that had earlier flown over Buckingham Palace. At 10.20pm, the celebrations culminated with all three ships coming together again and a 20 minute firework display lit the skies. Queen Mary 2 then led the other two ships in single file down the Solent as they headed back out to sea. Cunard has always enjoyed a close association with the Queen and during her reign she officially named two of the ships: Queen Mary 2 and Queen Elizabeth. The crew of the Type 45 destroyer HMS Diamond held a “street party” on its flight deck as part of the Diamond Jubilee celebrations. On arrival at Portsmouth Naval Base the ship gave a 21-gun salute and there was a flypast of helicopters and a Typhoon jet. On the same day, Southampton put on a free party in Mayflower Park with local bands and dancing. Despite the heavy rain, thousands turned up to party, showing true British spirit. At Exbury Gardens, children collected fallen petals to make a beautiful collage. Read more. Her Majesty The Queen visited the New Forest Show in Brockenhurst on 25th July as part of her Diamond Jubilee Tour of the country. 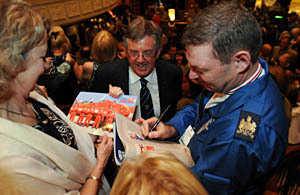 She was met by Alan Titchmarsh, 2012 Show President, before touring the showground both by car and on foot. She met exhibitors and presented prizes in the arena before departing by helicopter. The Queen was accompanied by the Duke of Edinburgh for her first ever visit to the show which marked the end of her Diamond Jubilee Tour. Hampshire County Council, The Woodland Trust and the Hampshire Gardens Trust have been providing sapling oaks to schools and Parishes across the county. They are also aiming to create two new areas of woodland in the North of Hampshire. The tree planting project is part of the Woodland Trust’s Jubilee Woods initiative which aims to have six million trees planted as a lasting legacy of the Jubilee. The Sir Harold Hillier Gardens in Romsey will also extend their collection of oak trees.